This is a lovely pair of cups with two interesting marks. I bought them 15 years ago in my early days of collecting. Inside one of them there is a "Jian Ding" (cerified ) seal from the Shanghai Cultural Relics Bureau. I believe this to be an an early PRC "export approved" seal mark. (20th c. Marks section # 276). The square seal mark is a "Tongzhi Nian Zhi" but is it of the period? Guangxu? or Early republic? The mark does give a clue to the other cup with a "Xushenfang Zhi" mark (Xu Shen Estate Ordered / made to order by Xu Shen House). To me Xushenfang could be a an estate of an Merchant of Northern China in late Qing Period. These bowls are very nice and quite a bit above the normal run of the mill pieces. Without any decoration except the gold rim we have only the marks and some technicalities to study for to forming any opinion on their date. What make this worth the exercise are their obvious similarities together with their differences. I have enlarged their bases, to make this point clearer. To me, their foot rims indicates that they might have been made in different kilns but within a short time span. To the foot rim on the one with the estate mark, there are kiln grit stuck. This indicates -I believes - it is fired on a bed of kaolin sand. To the foot rim on the bowl with the Tongzhi seal mark, there are no kiln grit stuck at all, indicating it has been fired standing on either a very fine grained Kaolin powder or a special "clay pad". Clay pads have been in use since at least early Ming and are still in use for high quality pieces, to let the foot rim contract during firing without cracking. Still we could note there has become exactly one such crack on the foot rim, which this technique was there to prevent. In this context I could mention that on a distinct group on - I believe - pretty recent fakes this has been ignored, which causes a set of radial fire cracks in the base. Something that *never* happened when the technique and know-how was still "alive". Regarding a date for these two bowls I believe we could safely rule out the later part of the 19th century on basis of the inventiveness of design. Just a plain gold rim does not seem to match with the late Qing dynasty. Still the quality of the brush painted "estate mark" is clearly Imperial in standard while the square seal mark most of all looks as it was asking to be excused. From this mixture of techniques and competence I take it that this pair should be dated to an inventive middle period with possibility to experiment and with Imperial competence still available. Thus, I would like to suggest the period between 1910 to the mid 1930s. This period also coincides with the time when the experiments with new eggshell porcelain production started again; A type of porcelain which is now a standard product still available white and undecorated. (Most of these are later getting an enamel decoration.) 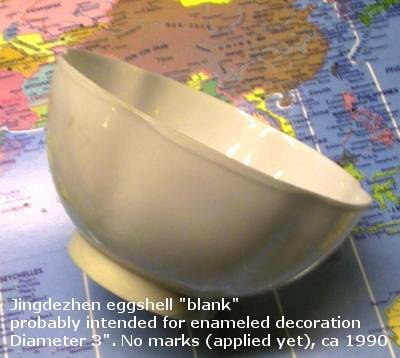 As an example of this, see to the right here for one white eggshell bowl that I bought myself in Jingdezhen about ten years ago. The specific feature with these modern eggshell bowls, are that they are so thin that they actually have to be fired upside down to prevent them for getting warped in the kiln. What then happens is that these modern bowls are getting a rough rim (visibly on the picture) something that could be hidden with exactly such a gilt rim the two bowls above have - without them having being fired upside down - as far as I know. This final feature strengthens the assumption that the pair are from a period when experimentation for starting up eggshell production was still in its infancy i.e. again the early 20th century, and before 1930.